1. Izzy went to her first art class at the new art center I found for her. She was excited and nervous and happy. Yesterday she checked a book out of the library of how to draw horses and has been drawing horses ever since! So she clearly has the talent, but more importantly she has the desire to pursue all things artistic. So as her mom, I am going to support that. 2. This week, if you visited a cemetery everyday a plenary indulgence could be gained for the poor souls in purgatory. I set out to do this with the best of intentions, but I think I messed it up. First of all, I forgot to go on Monday. I told Mr. Pete that I was going to make it up by going twice on Friday, but Mr. Pete was adamant that it had to be every day or bust. To which I reminded him that he didn't get to determine whether indulgences were granted or not and that I would take my chances that God would be pleased with my make-up visit on Friday. But then I noticed that I was also supposed to be receiving communion every day as well (I did the confession part last week). So for any poor soul that was counting on me, I apologize. I think a partial indulgence was the best I could do. 3. 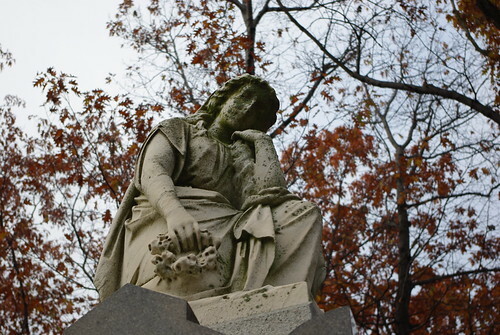 I did manage to get some great pictures of cemetery statuary though - and my artistically inclined daughter helped me find things to take pictures of! 4. I have to say that my kids have been very good sports about going to the cemetery this week with me. They are very respectful of the graves, they look at the name and dates, and they look for statues and headstones that will make interesting pictures. And from the homeschooling perspective, Izzy and Noah like to figure out how ages of the grave occupants from the dates on the stones. 5. I have an interesting picture to get for Find A Grave this week. It's for a WWII soldier who was MIA for decades but they found his remains a few years ago and he was brought home and re-interred here in his home town. The person making the request had a picture of his name on a wall for all the missing in Holland and wanted to add a picture of his grave site. So that will be an interesting one to do and since that cemetery is so big, I'll definitely need the kids to help me. 6. With the economy hitting 10.2% unemployment, I have noticed more and more panhandlers in the city. And they are getting bolder too. While we were in one of the cemeteries a man came up to us and asked me if I was visiting one of my loved ones. I explained what I was doing and he listened politely while I explained FindAGrave and being a volunteer photographer. And when I was done he promptly asked me for money to go to McDonald's. I gave him a few bucks from my pocket, but also made a mental note to not visit that particular cemetery alone even in the daylight. Another guy keeps coming by the house and calls me "soccer mom." He asked for $20 the a week or so ago. I was able to negotiate it down to $10 with a peanut butter sandwich. But I had to finally set some limits with him such as do not come up to me when I first drive in, and that I was only going to be able to help him out once a week tops and that was only if I had some extra cash. He made the mistake however of demanding some money from Mr. Pete and saying I told him to and Mr. Pete sort of got into his face a little bit. I haven't seen him since. 4. Someone very close to me received a potentially bad health diagnosis this week. Well, it's bad, but of course they make you wait until over the weekend before you can know for sure. Coming just a few months after my mom's illness this is all quite sobering. So I mentioned to Mr. Pete that my attitude about life had completely changed since Mom died. Every morning I get up and think, (for example) "Today is November 7. I have lived through 50 November 7ths. I may only have 10 to 30 November 7ths left. Maybe more. Maybe less. I better enjoy this one. I am thankful for this one." It's actually not as joyful as it sounds. It's more resignation to the fact of my mortality.